Travel Atelier organizes Greece vacations and tailor combination of Turkey & Greece Packages covering Santorini, Athens, Crete, Mykonos, Corfu, Rhodes and more. Greek Islands are grouped; Saronic, Cyclades, Dodecanese, Northeastern Aegean, Sporades, and Ionian. There are several options to embark to your favorite Greek Island while there are charters or regular flights from Europe in the summer season, starting your journey from the capital or one of the nearby islands via Turkey are ideal options for island hopping. Lesvos, Chios, Samos, Kos, Rhodes, Kastellorizo (Castellorizo) are very close to Turkey with year around ferry connections. 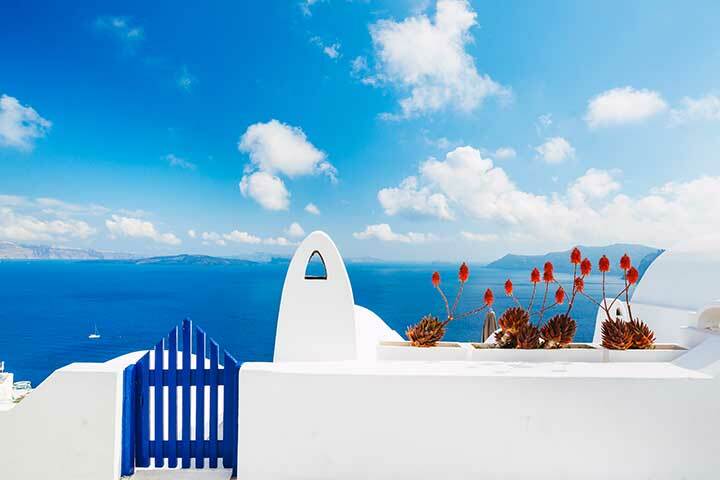 While Santorini and Mykonos have the fame, worldwide there are some Greek Islands hard to spot even on the map but ready to surprise you. All those islands have their connection with God and have their myths: some with the wind, some with sea or some with fertility. Islands are mostly well connected by water in summer months, and most have a good connection by air via Athens. Hydra, Spetses, Delos, Santorini, Folegandros, Paros, Naxos, Crete would make an excellent collection. Good food, history, magnificent vistas, fun-filled evenings and lovely beaches would be a standard of those islands, except Hydra where there is no beach. 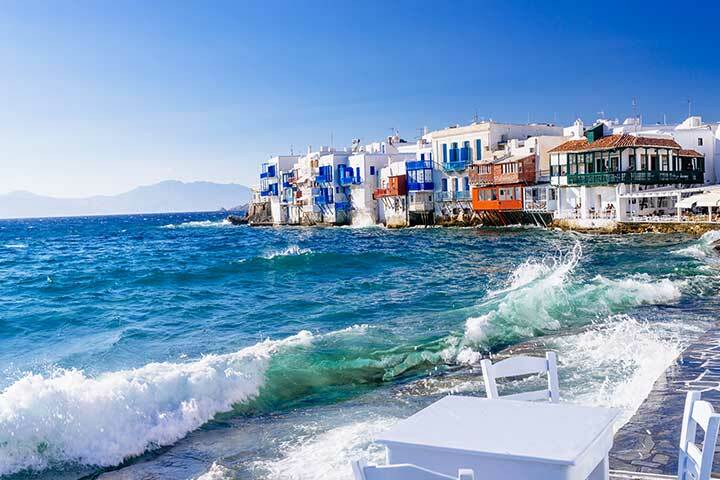 Starting from Athens shortlisting Hydra, Mykonos, Santorini, Crete would be ideal for 8 to 10 days. Hydra: Close to Athens, less touristy and getaway resort for Athenians, no cars or vehicles but scooters and donkeys, Hydra is beautifully located on a rocky hill with excellent views of Aegean. Mykonos: mostly known as a party island, it is a very cosmopolitan destination that has great beaches and beach parties. However, one can also consider here as a honeymoon island with quiet and secluded corners of the island. Great small hotels offer excellent accommodation options, delicious cuisine, and exclusive experiences. Little Venice is popular which is located by the yacht marina, and it is the right place for dining, wining and shopping. Paradise and Super Paradise Beaches are well known for party venues on the island. Even if you are not a party person walking within narrow back streets of the center, window shopping enjoying few drinks here and there, connecting with locals already offers a good experience. There are limited taxis so having your rental car or scooter is recommended. The prices are higher than other islands. 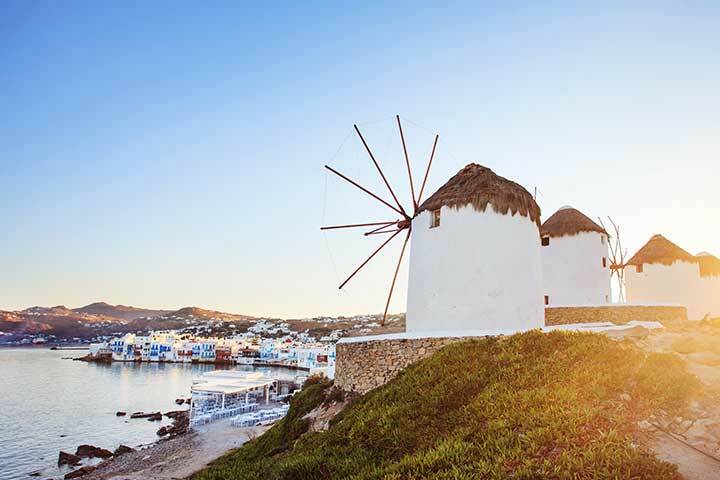 You can take a fast ferry from Athens and arrive at Mykonos after 2, 5 hours otherwise regular ferry takes about 5 hours and alternatively, a 20 minutes flight will get you to this beautiful island. Delos: A short half an hour boat ride from Mykonos, Delos is a must see the island of Cyclades. A myth says you are not allowed to die or born here; so not an island to stay overnight but it is one of the most famous islands with archeological finds. A day trip is ideal for exploring this interesting place. Santorini: The Pompeii of the Aegean a group of Islands of Cyclades makes it as well as the present-day crescent shape is a result of the activity of the volcano in prehistoric times feeding the myth of the lost Atlantis. Widely known as the island of romance, great sunsets it is an island of love. Island attracts a lot of destination weddings and honeymooners. The Rocky and steep terrain of volcanic rock and its caldera make the island unique. Cave houses dug into the volcanic rock mansions, domed churches cobbled streets and thousands of stairs between the sea and the town over the cliffs, donkey rides, swim at the volcano hot springs, windmills, street art vendors & galleries, a vast history including Venetians, Ottomans and ancient Akrotiri from 3rd.Millennia BC, the Bronze Age. After years of excavations not being opened to the public as of 2012, the site & museum is open to the visitors. Great restaurants & taverns, local wineries and their labels, nightlife of different choices make this island an ultimate destination in Aegean. Thira (Fira) being the capital of Santorini, there are interesting parts of the island both for exploring and basing yourself. Fira also has the station for the cable car and center of all main attractions. Firostefani, the crown of Fira located just above, Pyrgos the highest point of the island a traditional village, Imerovigli between Fira and Oia with volcano views and Skaros Rock, Kamari, and Kamari Beach is a resort part at the crescent shaped bay of the island. Oia probably the most upscale and exciting village of all at the Northern Greece and houses most well-known hotels, restaurants and art galleries, jewelers and designer shops, and with Ammoudi port below with waterside fish restaurants. 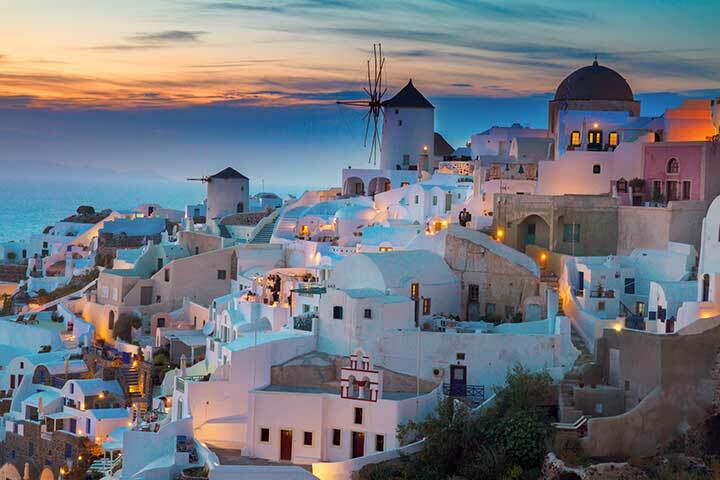 Sunsets of Santorini would give best pictures from any angle so the blue domed churches, however, Oia is the most picturesque with windmills at the background. 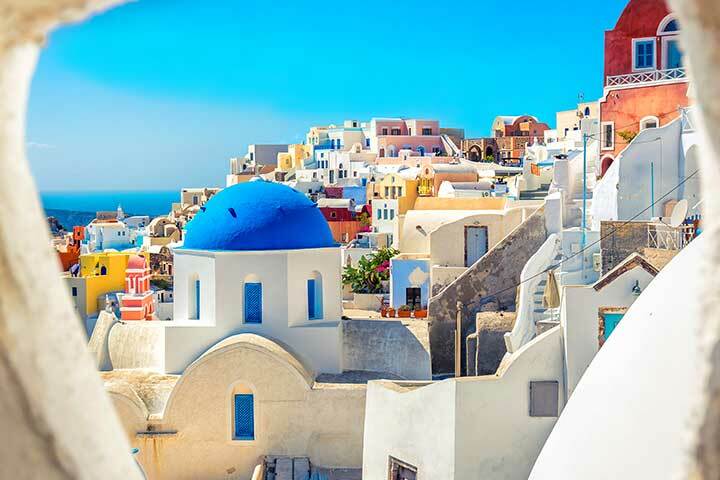 Reaching to Santorini with fast ferries in the summer is only 3 hours from Mykonos and daily flights from Athens are the right choices for transportation. Fast ferry from Athens would take 4 to 5 hours. The Biggest island of Greece, goddess Rhea, hid the newborn Zeus in a cave, once the lair of pirates, Crete is divided into four prefectures. Heraklion the capital, Rethymno, Chania, Lasithi. Home of the Minoan civilization with important archeological finds at Knossos Crete has long sandy beaches, small mountainous villages, beach resorts, gorges and many monasteries. Each prefecture offers different atmosphere and venues. An all year around island offers many types of tourism activities diving to cannoning, golfing to hiking and has a unique cuisine which is delightful. Agios Nikolaos built at the North part of peaceful Mirabello Bay, famous for its lake like lagoon is the most charming feature. Legend suggests that Athena and Artemis bathed in its waters. Great shopping, nice restaurants cafes calm atmosphere and the famous island of Spinalonga from Venetian era is one of the important attractions reached by small boats of Kaiki. Cretan food is also most famous, and local producers like olive oil and Cretan Honey are unique. Little further east of Agios well regarded Elounda area boosts with luxury hotels and villas. It is significant that Elounda accommodation most have private pools of each and every room at specific hotels and resorts. Agios is easy to reach from Heraklion, and you can easily spend more than a week vacation in this charming destination. It is also known as Rhode was the goddess of the island and wife of Helios, the daughter of Aphrodite and Poseidon, is the largest of the Dodecanese complex. While Rhodes has a long history dating back to Bronze Age, the island is most famous and known as the home of Knights of Malta or Knights of Saint John and a medieval inner city which is almost intact and is a great attraction for its visitors. Shops, cafes, restaurants, churches mosques and the palace of Grand Vizier are few to name as special of the old town. While there are a few number of boutique hotels in the medieval city and resorts near by the center, a 45 min drive would get you to a unique and picturesque village called Lindos, Jewel of Rhodes. Lindos has been home to great artists, such as Chares, designer and sculptor of the Colossus of Rhodes, Lysippus, Pythokritos son of Timocharis, who along with Athinodoros and Agisandros created the Nike of Samothrace and the Laocoon Group, as well as to the historiographer Evagoras of Lindos, Timachidas, author of the famous Chronicle of Lindos and the poet Cleobuline. White washed houses cobblestone winding small streets, an acropolis & castle at the top makes this traditional village unique. Traditionally visitors enjoy a donkey ride to reach to the acropolis. Lindos houses great beaches and has a calm and romantic feel. Rhodes has easy access from other Greek Islands and two ports from Turkey, Fethiye, and Marmaris. It only takes an hour by ferry throughout the year. Otherwise, Rhodes has frequent flights from Athens too. Travel Atelier executive team traveled last 15 years to Greece and its islands and have great connections with travel professionals and have an extensive knowledge of the insider information of those places including an excellent choice of good hotels. 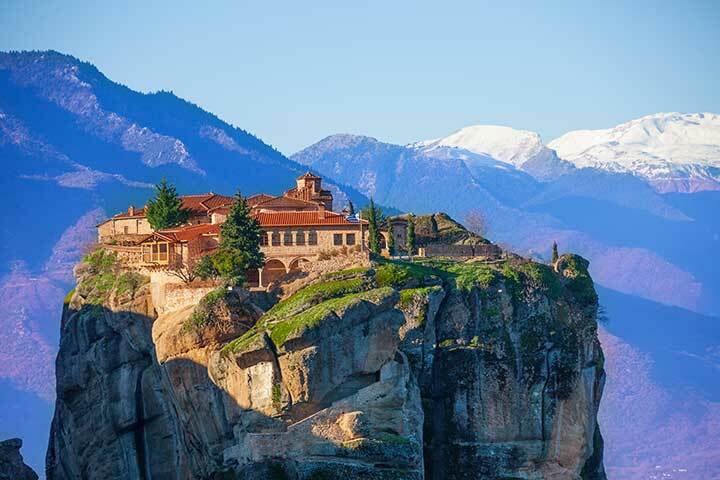 While the collection of islands not limited those mentioned above we will be happy to tailor a dream vacation in Greece, on a Greek Island and Turkey. Those who love travel independent will still be independent with their choices we will be just making sure they are on the right track and wherever they need assistance it is available. 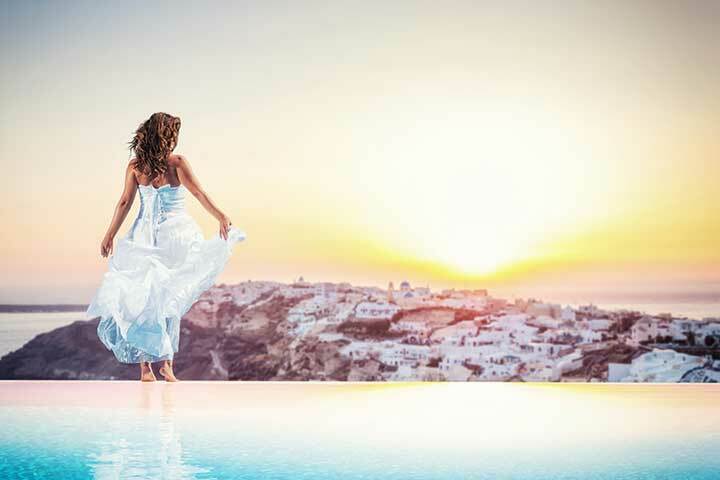 For your Greece vacation, we can book your hotel, tours, guides, daily activities, transfers, private yachts or helicopters and make sure you have the best what this great country offers. 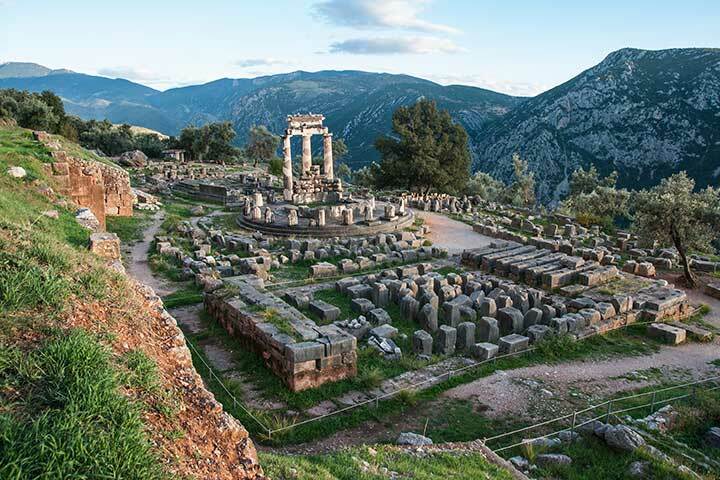 Greece and Turkey have hospitality in their people's genes; both countries are proud of their history and cuisine and eager to share their Culture. 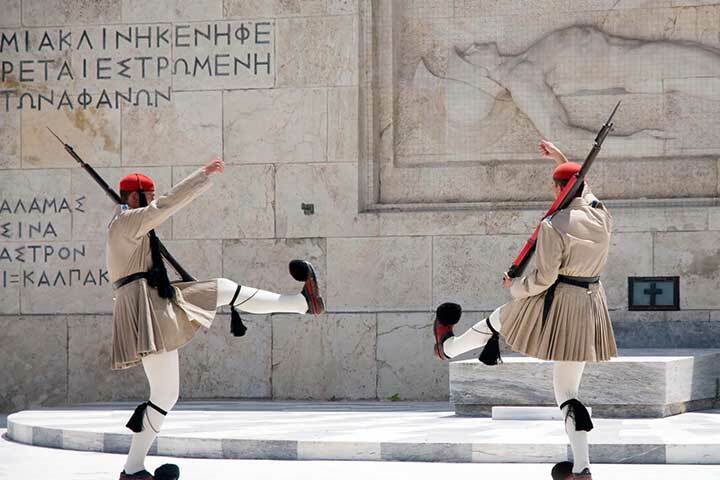 And not last, but least against usual thoughts of many; Turks and Greeks are good friends and get along well. Do not forget you are on your own without a good travel agent.